Winter flying is great! The pre and post flight are the challenge! Getting all the frost/ice completely off the aircraft then doing a complete pre-flight with those low wind-chill factors is no fun. But the reward is enhanced performance due to the cold dense air (low-density altitude?) and some beautiful scenery! Just as the cold affects the human body it also affects our aircraft. Care must be taken during the preflight paying special attention to the exterior (no frost or ice) and the recommendations for preheating must be followed so there is warm oil ready to circulate during those first critical seconds of engine startup. Based on the location of the battery, preheating may also help raise its temperature which will increase its output ability. In extreme cold you’ll also want to check the tires closely. If they are filled with air extreme cold will cause the pressure in the tires to drop. Many owners op to have their tires filled with nitrogen which reduces that problem. A very important item that is virtually impossible to check during a preflight is the battery’s condition. The main purpose of the battery is to provide the power needed to start the engine. Once the engine is started the alternator (or generator in some very old aircraft) takes over the role of supplying the electrical power needs of the aircraft (avionics, lights etc.) including recharging the battery. The batteries in our aircraft are similar in design theory to the ones in our cars but they are not as large and therefore do not have the large power capacity that car batteries have. This is done to save weight. Based on the aircraft, they may be 12 volt of 24 volt variety. Cold effects the battery’s output greatly. We’ve all experienced cold weather starting our cars. The colder it gets, the lower the battery output due to the effects of temperature on the chemical reaction inside the battery’s cells. Batteries also lose power as they age. Especially in the winter, first make sure all the avionics are off and any interior lights are off as well. Next, turn the master on. 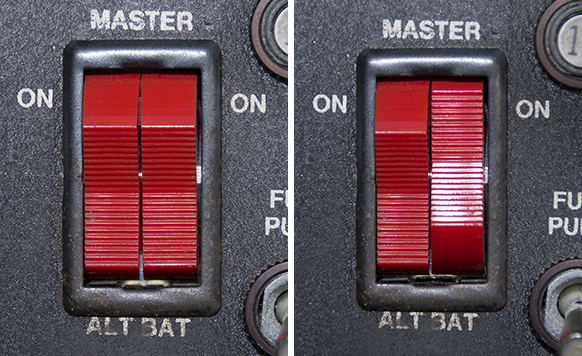 If your aircraft has a “split” master switch, only turn on the battery side (you’ll see why in a bit). Then lower the flaps and turn on the beacon, strobes, landing/taxi and Nav lights (if it’s a night flight) and quickly walk around the aircraft checking all the lights. Then shut the master off. Now perform the remainder of the preflight. By doing the lighting check first, when you shut the master down, it will allow some time for the chemicals in the battery to at least put back a small amount of the power you just consumed (sometimes referred to as a surface charge) while you perform the rest of the pre-flight and get settled in the aircraft. When you are ready to start the engine, if there is a split master switch only put the battery side on. Alternators need what is called “field current” to perform its designed task which is to create 12 (or 24) volts. That field current comes from the battery until the engine is running and the alternator takes over providing the electrical power for the aircraft. By using only the battery side of the split master switch you will not drain that field current from the battery and it will be there to help start the engine when you need it the most. Do not perform any other electrical functions prior to engine start: Do not raise the flaps or listen to the ATIS. Leave the beacon/strobes off until the engine is running! FAR 91.209(b) gives the PIC permission to turn off required anti-collision lights (beacon &/or strobes) due to operating conditions and safety considerations. Once the engine is running, immediately turn on the alternator side of the split master switch (if equipped) and let it do its job. Now turn on the required beacon/strobes and any other lighting, avionics etc. you need! By following the above recommendations and the manufacturer’s “cold start” procedures per the checklist, you’ll start the engine and get that needed cabin heat up more quickly to enjoy winter flying!